Heat oven to 350°F (325°F for dark or nonstick pan). Line 9-inch square pan with foil, allowing some to hang over edges of pan. Grease bottom and sides of pan with shortening or cooking spray. Make brownie batter as directed on box. Spread in pan. Bake 28 to 31 minutes or until toothpick inserted 2 inches from side of pan comes out almost clean. In 1-quart saucepan, melt butter over medium-low heat. Stir in flour until smooth. Stir in brown sugar, corn syrup and 1 egg until well blended. Increase heat to medium; cook 2 to 4 minutes, stirring constantly, until mixture just begins to boil. Remove from heat; stir in vanilla and pecans. Spoon pecan topping evenly over baked brownie. Bake 13 to 17 minutes or until golden brown and bubbling along edges. Cool completely on cooling rack, about 2 hours. Using foil to lift, remove brownies from pan, and peel away foil. Cut into 4 rows by 4 rows. 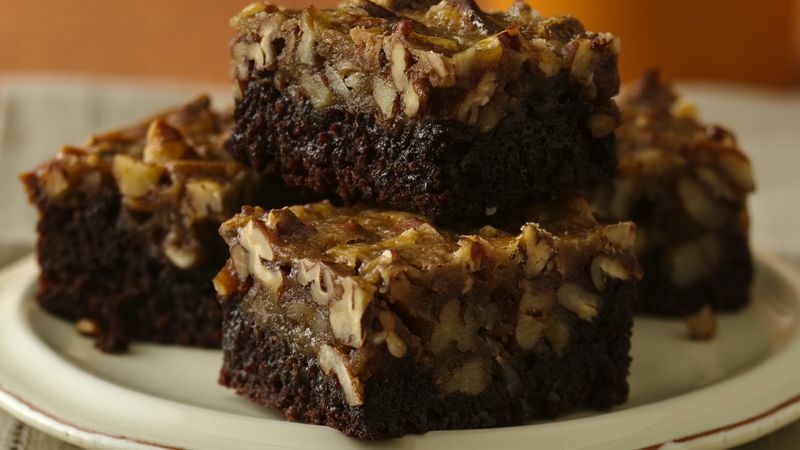 If desired, garnish each brownie with a pecan half. Serve brownies with a dollop of whipped cream.